Samsung Galaxy Note FE Appears on GFXBench Before its July 7 Launch - Playfuldroid! Samsung Galaxy Note FE (Fandom Edition) has now appeared on GFXBench benchmarking site which indicates that the South Korean company could be testing the phablet before its launch. In the past week, a Samsung device with model number SM-N935S that is speculated as the Galaxy Note FE was spotted on Geekbench. 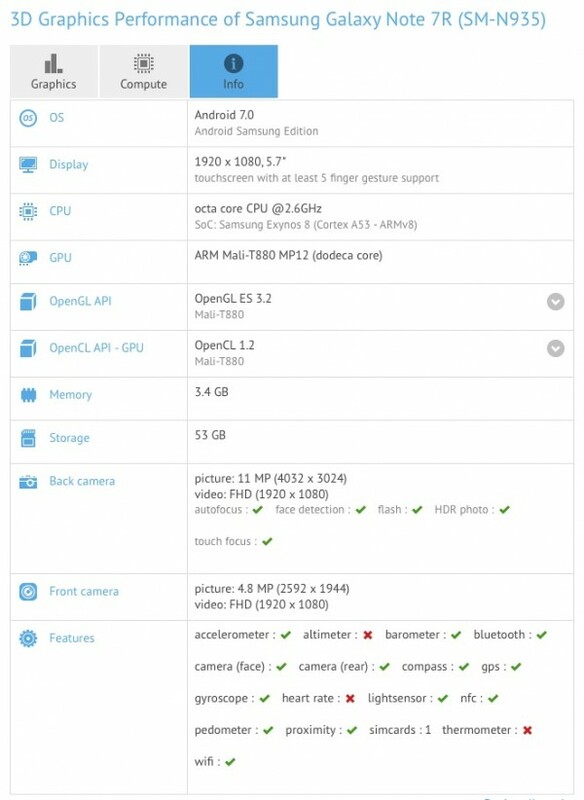 On GFXBench, a Samsung SM-N935 handset has been spotted along with Galaxy Note 7R moniker. It seems to be the refurbished Galaxy Note 7. Even though the original Note 7 came with 5.7-inch QHD screen, the GFXBench listing shows that the Note 7R has a 5.7-inch full HD screen. This suggests that the Note 7R may come with a scaled-down screen resolution. Samsung offers a feature on its recent flagship that allows users to change the resolution of the screen. Hence, the GFXBench listing of Note 7R could be showing be the phone with default resolution of full HD. The Galaxy Note 7R is powered by Exynos 8 chipset that includes a 2.6 GHz octa-core processor. It features 4 GB of RAM, 64 GB internal storage, 12-megapixel rear camera, 5-megapixel front camera and it is running on Android 7.0 Nougat. Rumors have revealed that it would be packed with a 3,200mAh battery. The Galaxy Note FE is pegged to launch on July 7.